The Top 5 Outfield Baseball Gloves Today - On a Budget? Playing the outfield in baseball is challenging and requires the best out of you, but using the proper outfield baseball gloves will make it a lot easier. There’s no question plenty such gloves are available on the web, but how do you find out which is the best? Rather than have you go through each one, I’ve done the work for you. Here are the most popular baseball gloves online and I line them up one after the other. Take note: These are cheap outfield gloves with low prices but they are rated high and perform great. 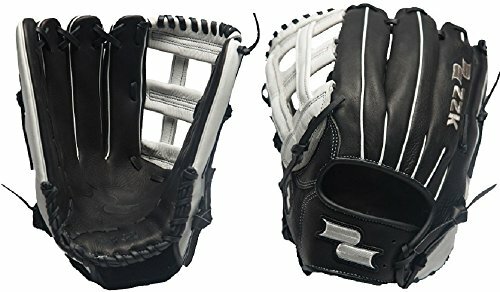 If you’re looking for cheap baseball gloves but still wish for something good, then you need to consider the Rawlings Select Pro Lite Youth Series. It’s available in sizes from 11 to 12 inches, in increments of a quarter-inch. You’ve got multiple colors and models to choose from, with webbing options including Pro H, Pro I, Vertical Hinge, and Basket Web. The Rawlings Select Pro Lite Youth Series are confirmed bestsellers, and it’s easy enough to understand why as the price is so attractive. But the features explain why so many young players love these gloves. First of all, the options include glove designs patterned after the same glove styling as the gloves of their baseball heroes. These include Manny Machado, David Price, Francisco Lindor, Josh Donaldson, Addison Russell, Bryce Harper, and Kris Bryant. Of course kids will want the gloves their favorite player uses. Once they get the glove, players can almost immediately use them for game play. The glove has already been broken at the 90% level at the factory. The player only needs to complete 10% of the break-in. This will be enough to allow the glove to mold itself to the specific shape of the player’s hand. There’s no denying how securely this glove fits. What’s more, the hand opening is slightly smaller than the standard fit, and this gives you greater control. Your hand also gets extra layers of protection with the padding for the palm and index finger, which are key impact areas. The soft leather shell is durable enough to maintain the shape. The well-formed pocket shape is maintained by the all-leather lacing. 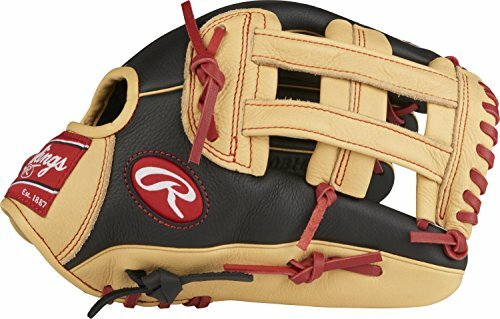 This Rawlings glove is for youth play primarily, but it’s also the glove to use if you want to teach someone the fundamentals of outfield play. Those who want cheap outfield baseball gloves from the renowned Easton brand will do well with the Mako Outfielder’s Pattern Comp Series. It’s almost game-ready, though you may need a week or two to break it in properly to get a perfect fit. This uses soft premium leather, and the double-oiled tanned primed cowhide offers reliable durability. It also comes with double welt construction and an especially ergonomic design. It’s eminently comfy for your hands, yet it’s flexible and quick for all those plays in the outfield. You get a better pocket shape and enhanced finger movement with the Dynamic 2X finger welting. The palm lining uses oiled hog hide, while the finger lining is with super-soft sponge-tricot. The outfield model measures 12.75 inches and comes with an E-Trap web and an open back. With its low price, easy break in, and great pocket, many consider these their favorite baseball outfield gloves. 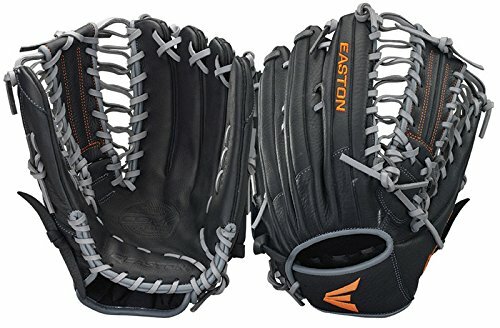 All brands say the same thing, but Easton outfield baseball gloves actually live up to the hype and well worth the money. The new Mizuno MVP Prime is quite affordable compared to other Mizuno gloves, though of course it’s a tad more expensive than other brands. This glove uses Bio Soft leather. That somehow gives you the perfect balance between the firmness you need to catch baseballs (and protect your hand) while it’s also soft enough to feel comfortable when you wear it. The outfielder model comes with an 11.5-inch opening, along with a tartan web, an open back, and real leather laces. That durable lacing has that same high quality you get with professional gloves. This will help keep the glove usable throughout your baseball season. It doesn’t look cheap at all, and it even has an expensive look with its embroidered logo. 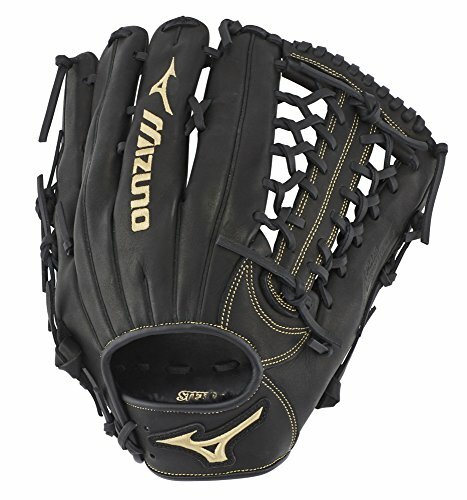 It’s a Mizuno, and for many that’s enough to regard it as one of the best outfield baseball gloves in this price range. 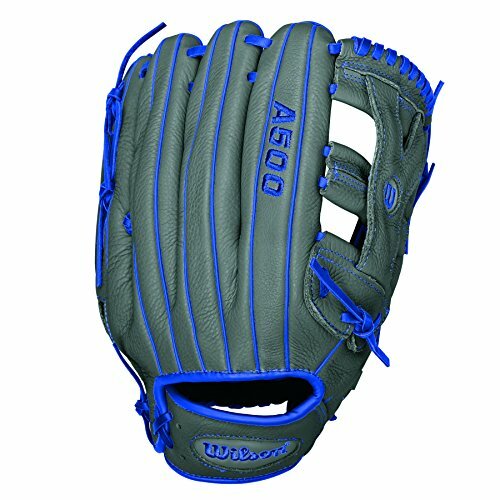 If you’re an outfielder, you can do worse than get the Wilson A500 Yasiel Puig gloves. This outfielder’s glove measures 12.5 inches and comes with an H-web. The H-web is an outfield standard webbing design. It gives you a nice pocket in which the baseball can gently fall in. The top grain leather used for the glove somehow doesn’t weigh all that much. Yet you get the right feel for it especially when you’re running to catch fly balls in the outfield. To reinforce the pocket of the glove, you’ve got 2X palm construction that also protects your hand. The pocket is kept durable by the dual welting, which has 2 pieces of leather lining each finger. This gives you a curved finger design and bowled shape for a deeper pocket. The added support along the fingers also boosts the durability so the shape will hold over time. This is an all-leather glove, using top grain leather. With its basket web, leather laces, double palm construction, and rolled dual welting, you’ve got a fantastic glove for use in the outfield. It can work with 8-year old players very well, and it will definitely last until your kid outgrows it. It doesn’t need all that much break-in either, and parents will love the fact that it’s super affordable. At this price point, you’d hardly expect a glove of this caliber from such a well-known brand. Worn on the right hand for a left handed thrower. The 12.75″ size and the H-Webbing of the SSK Edge Pro Series also come with an open back. This used to be a lot more expensive, but then it’s for 2016 so the price has dropped enough. But just because it’s an older model doesn’t mean it’s obsolete. This uses premium US steerhide leather. You’ll never suspect that leather of this quality can be available in this price range. The leather has been injected with oil to provide excellent feel and to boost its durability. Kids will love to play with this, while parents will of course appreciate its low price and the fact that this can be used until their kid outgrows it. The pocket is also well-maintained, and you have thick dye-through rawhide lacing measuring 3/16 of an inch. It looks like a serious glove for serious play, and it should appeal to no-nonsense outfielders who want a reliable glove in the outfield for a long baseball season. It’s another example of how cheap baseball gloves can be terrific for young players. So which of these cheap outfield baseball gloves is the best? There’s no single right answer as each of these gloves has its own benefits and advantages. What you should do is assess each one and determine which suits you the most. But in all honesty you’ll likely get your money’s worth either way, because there are good reasons why these are the bestsellers on Amazon and other retailers.